The Carolina Panthers added some depth to their wide receiver corps on Friday, as the team signed veteran Chris Hogan. It is a one-year deal. Hogan, undrafted in 2011, has spent nearly all of his playing career in the AFC East. Out of college he signed with the San Francisco 49ers, but was cut out of camp. The New York Giants brought Hogan onto their practice squad, but for only 11 days. Hogan signed with the Miami Dolphins’ practice squad toward the end of the 2011 season and spent the offseason with the team, only to be cut in September the next year. He joined the Buffalo Bills’ practice squad in November 2012 and stayed with the team for four years, playing in 48 games and recording 87 catches. The 6-foot-1 former Penn State lacrosse player signed a free-agent contract with the New England Patriots in 2016. With New England, Hogan played 40 regular-season games with 28 starts and was part of the 2016 and 2018 Super Bowl-winning teams. He had a career day in the 2016 AFC championship against the Pittsburgh Steelers, with nine catches for 180 yards and two touchdowns. 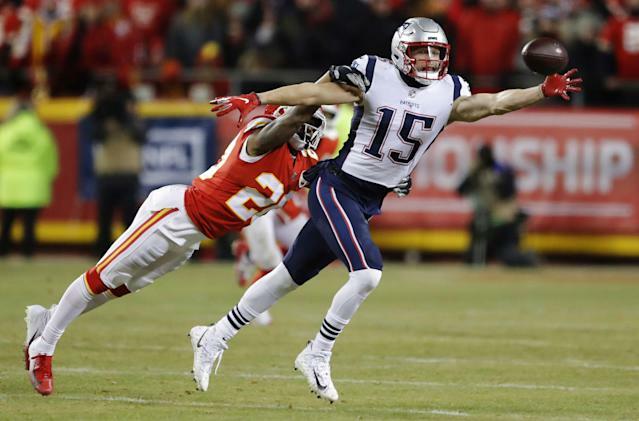 Though he was quieter statistically in last year’s AFC title game against Kansas City (five catches, 45 yards), Hogan’s one-handed, 11-yard catch on third-and-8 in the fourth quarter kept a drive alive that led to a touchdown. NBA playoff predictions: A three-peat for the Warriors?